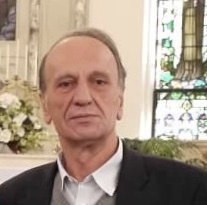 Nika Skrelja of Hopewell Junction, NY died on March 17, 2019 after a fierce battle with cancer; he was 70 years old. Nika was born in Shen Gjergj, Montenegro on July 18, 1948, the son of Rrok and Luxhe (neé Marku) Skrelja. He was a teacher in his home country before immigrating to the United States in 1986. Nika was a lover of food, an avid fisherman, a master chess player, and an eclectic dancer who loved his family — especially his grandchildren. Nika is survived by his son Rocky, his daughter Violeta”Vicky” Mazzella and her husband Giuseppe, his daughter Elizabeth Skrejla, grandchildren Angelina, Samantha, and Emma; and his brothers Deda and Luigj Skrelja. He was predeceased by his parents, his sister Liza Dusovic, and granddaughter Ava. All are welcome to attend a visitation on Wednesday, March 20th from 2-9 PM at the Joseph J. Smith Funeral Home in Mahopac, NY. A Mass of Christian Burial will be celebrated on Thursday, March 21st at 11 AM at Our Lady of Shkodra Church in Hartsdale, NY. Interment will follow at Raymond Hill Cemetery in Carmel.